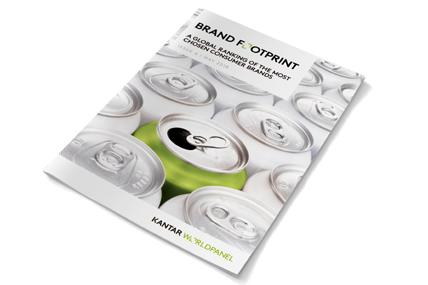 Kantar Worldpanel has launched 2018 Global Brand Footprint report today, which looks at which brands are being bought by the most consumers the most often. In the past one year, there are 17 global FMCG brands that are chosen by consumers more than one billion times a year across all markets. Coca-Cola is the world’s most chosen brand and is picked from the shelves 5.8 billion times in a year. The latest China ranking has revealed that Chinese brands dominated the Top 10 most chosen brands’ list. Yili continues to top the list and managed to grow its Consumer Reach Points (CRPs) 2 by 6%, Mengniu and Master Kong maintained 2nd and 3rd rank. Yili and Mengniu are the only 2 brands that are chosen by Chinese consumers more than one billion times. Nongfu Spring expanded its consumer reach thanks to the continuously investing in their new products with a re-launch of its “flavored vitamin water” and “Tea Pai”, which helped the brand to reach more young consumers. Now it made the list of the Top 10 brands for the first time with 335 million consumer reach points last year. In 2017, 55.3% of urban families in China bought the brand for 3.5 times on average. The Brand Footprint ranking shows that most of the growing brands enlarged their shopper base. “In 2017, China FMCG market recovered and with it many of the leading brands struck back. The Brand Footprint ranking shows that a growth strategy based on winning new consumers is more effective than one that aims to enhance loyalty or purchase frequency. With further integration of online and offline channels, brands will have to build an omni-channel strategy to attract new consumers” said Jason Yu, Managing Director of Kantar Worldpanel Greater China. Among the 50 most chosen brands in China, Nongfu Spring was the one growing the most (+34%). There was significant change to the list of the top 10 fastest rising brands. C&S, Yakult and Yili all made to the top of the league for the first time. Sanquan & Synear also re-entered the top 10 list again. C&S not only joined the club of Top 50 for the first time, but also the first time in the Top 10 list of the fastest rising brands. Thanks to its product line expansion and large pack size strategy which met the greater consumer consumption demands. Sanquan saw its consumer reach increase by 9%, thanks to its extensive product lines and campaigns highlighting the pleasure to be found in cooking.